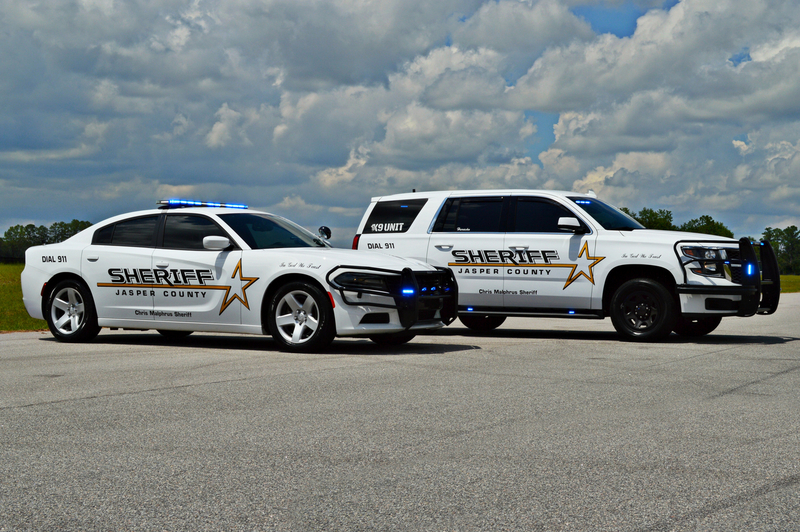 (Ridgeland, S.C.) – Under the leadership of newly elected Sheriff Chris Malphrus, the Jasper County Sheriff’s Office recently underwent a major fleet overhaul. During the agencies latest fleet renewal, the agency acquired a handful of 2016 Dodge Chargers and a 2017 Chevrolet Tahoe K-9 unit to replace aging first generation Dodge Chargers being phased out due to mileage and high maintenance costs. The new batch of cruisers hit the streets featuring a refreshed graphics package to symbolize the agencies new vision and focus on community oriented policing. The shift in the design features a bold black and yellow design prominently displaying the words “In God We Trust” on the front fenders. As part of the agencies modernization process, the new cruisers also feature enhanced lighting packages to enhance officer safety while on calls or traffic stops. As always, we’d like to extend a very big THANK YOU to the Jasper County Sheriff’s Office for inviting us to photograph their new units. Please visit the Jasper County portion of the database to view additional images from our most recent photoshoot with this great group of professionals.